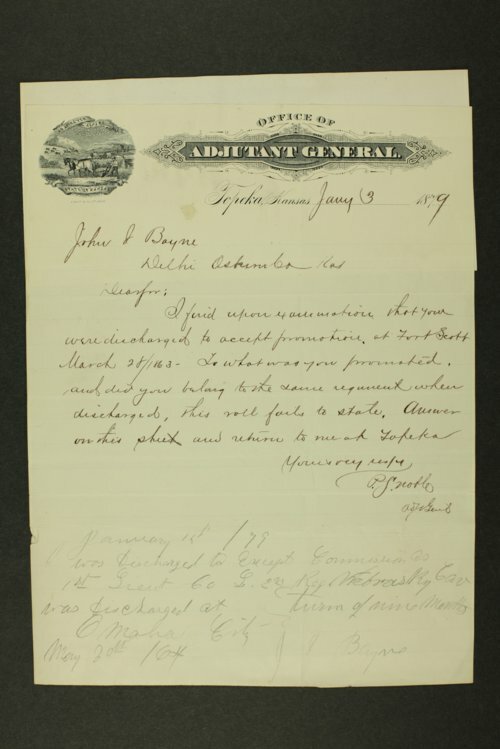 This correspondence was sent and received by Kansas Adjutant General Peter S. Noble to and from militiamen across the state, often written on stationary from their places of regular employment. The Kansas University Cadets are frequently mentioned. Included are petitions for the organization of militia companies in the cities of Raymond, Offerle, Burlingame, and Caldwell, among others. Also included are petitions for weaponry and ammunition to protect the cities of Oberlin, Spearville, and Bazine from Indian attacks.